©2016-2018 Jorge Diaz-Amador. Text, images and other content on this site are original copyrighted works, except where noted. CinemaTechnic and Jorge Diaz-Amador own exclusive rights to this content under the United States Copyright Act of 1976. Unauthorized use and/or duplication of this material without express and written permission from this website’s author and owner is strictly prohibited. Introduced in 1952 This was the first ARRI 16mm camera. The “St” designation meant “Standard”, and the camera is also referred to as the Arriflex 16S. This is one of the most successful ARRI camera designs and over 20,000 were made. 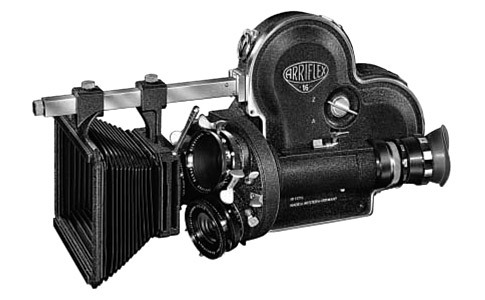 In many ways the 16 S follows the design paradigm of the Arriflex 35 II. Both are designed as MOS cameras. Both use a “bowtie” spinning mirror reflex design. Both use a 3-lens turret accepting ARRI mount lenses (later re-designated ARRI Standard mount when ARRI Bayonet mount was introduced). Both use a straight viewfinder tube in the “door”. The earliest 16St cameras (below No. 5600) have a viewfinder made by Carl Zeiss Jena, with a non-removable eyepiece. The film door is flat on these cameras, and the area near the magazine port is ribbed. 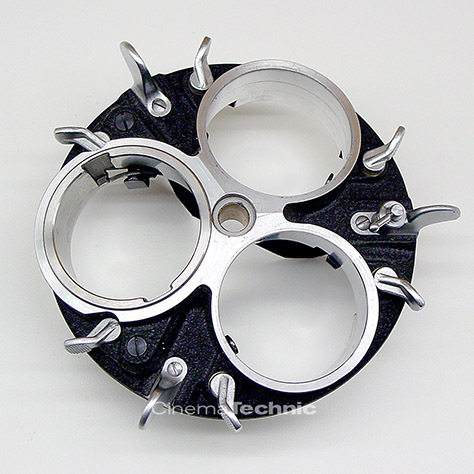 The sprocket guard lacks rollers and the spring drive belts are exposed. Later 16S cameras (No. 5601+) have the standard viewfinder with a detachable eyepiece, the same as the 35IIC and 16BL, and the film door is beveled, not flat. Starting around No. 8001, the drive springs are covered and the sprocket guard has two rollers. The ribbing near the mag port catch was also eliminated. The 16 S is different than the 35IIC in that it has internal capacity for 100ft of film, the lens turret is divergent, the motor is mounted behind the camera allowing for a flat bottom, and the ground glass is mounted near the eyepiece. The 16 S divergent turret is designed to help prevent wide angle prime lenses from seeing the ends of longer primes mounted on the turret. The camera was meant to be used with 3 prime lenses mounted in the same manner as a Bolex. Vintage Carl Zeiss prime lens with ARRI Standard lens mount in stainless steel. Most other manufacturers used aluminum mounts. Arriflex 16S cameras accept only ARRI Standard mount lenses (see photo above) unless the camera is the 16SB model (see below). All ARRI Standard mount lenses can be used on the 16S, wether they were designed to cover 16mm or 35mm. 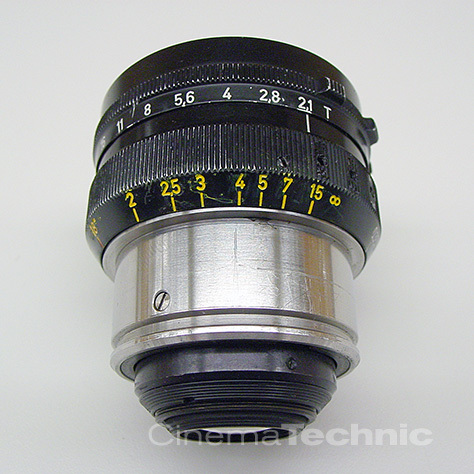 The reverse is not true, 16mm format lenses cannot be used on 35mm ARRI film cameras. Arriflex 16SB turret with one ARRI Bayonet mount (note stainless steel insert) and two ARRI Standard mounts. The 16 SB is the most common variant of the 16 S. The SB has one stainless steel ARRI Bayonet mount and two ARRI Standard mounts. This allows you to mount Bayonet mount lenses, expanding your lens choices, and making the higher quality 16mm lenses, such as the Zeiss Super Speed (High Speed) T1.3 primes, available to the 16 S. PL mount lenses cannot be fitted to the ARRI 16S or SB. The 16S can accept 400 ft magazines, allowing compatibility with larger film loads and film on standard cores (rather than metal spools). The magazines use a separate torque motor that can be removed from one magazine and placed on another. There are also very rare 200 foot magazines. The magazine system is a bit cumbersome and not suited to quick mag changes. The 16 S is significant in that it was the first reflex 16mm camera to utilize a registration pin. Before the 16S only the Mitchell 16 had a registration pin. This advance brought the same technique used to ensure perfect registration in 35mm to 16mm, increasing the quality of the results. Every ARRI 16mm camera manufactured since has used a registration pin. The low cost and the wide availability of the cameras, makes it easy to justify the purchase of a 16 S as a second camera, or for personal use. The manufacturing quality of the 16s is every bit as good as the newer ARRI cameras. It is just an older design. One of the drawbacks of the 16 S is that by making the lens mount a moving object, especially with the turret’s flange at an odd angle to the film plane, it is not possible to have perfect flange focal distance calibration. The fact that this was not considered a major design consideration by ARRI engineers is the fact that the ARRI Std. Lens mounts were made out of aluminum. Aluminum is a relatively soft metal, and wearing out enough aluminum to change the flange focal distance was a possibility. In the 50’s when the 16 S was designed 16mm focal length was considered a wide angle and a f2.8 stop was considered very fast. Most shooting was done at 25mm or more and using deep stops. Most focusing was done by eye. Under these conditions, unless the ground glass was off by a significant amount, errors in flange focal distance could be tolerated much more than today. The film available in the 1950’s probably could not resolve more than 50 lp/mm. Compare that to today’s high resolution negative films that can resolve over 100 lp/mm. Another problem is that the supply of spare parts for the 16 S is extremely limited. Parts have not available from ARRI USA since at least the 1990’s.. Supposedly New York University bought the remaining stock of spare parts in the world to keep their ARRI 16S cameras going forever. It is important to be sure of the condition of any 16 S you consider purchasing. These cameras are very labor intensive to service. A severely worn or neglected camera cannot be economically repaired. NOTE: I have preserved below my previous comments about Super 16 conversion for the 16S, in the interest of historical accuracy. Super 16 conversion for the 16S is NO LONGER AVAILABLE. Please do not e-mail asking if it is available. The company that had provided this service for us has gone out of business. They burned many people along the way, including us, and a number of our customers. We had to do substantial corrective work to each of the two cameras that this company converted for us, due to the very sloppy quality of their work. As delivered, the cameras were basically unusable. The 16 S was designed as a standard 16mm camera (its design predates the Super-16 format by 20 years). It’s design is very poorly suited for conversion to Super-16 because of the design of the gate and mirror. Please be very careful about anyone saying they can convert this camera to Super 16. The 16S can be converted, but it requires many new parts to be manufactured and a lot of very difficult machine work. CinemaTechnic has no plans to introduce our own Super 16 conversion for this camera, due to the extremely high cost of development, and the high cost in labor and materials to convert each camera, which we do not think can be passed on to the customer who has purchased a used camera for an average of less than $1000. It is possible to convert the 16S to Super 16. A PL Mount. The 16S cameras are excellent choices for Extreme Sports and Action cinematography. The Arri ST and A-Minima cameras are about the same size. Compared to the Aaton A-Minima, both are Super 16, have PL Mounts, and are Mirror Shutter cameras (the Aaton viewfinder is far superior). The advantage of the Arriflex ST Super 16 over the A-Minima is that the Arri ST uses Super 16 film in the standard emulsion-in feed configuration, either on standard metal 100′ daylight spools, or on 400′ core loads in the Arri ST Magazine. The Aaton A-Minima can only use film wound emulsion out, on special 200 ft plastic daylight loading spools. These loads can only be used on the A-Minima. This camera is essentially a 16 S without internal film capacity. It uses a different 400ft film magazine than the 16 S. If you prefer to shoot with 400ft film loads it can be a good choice as opposed to a 16S. If you do not often shoot 100ft film loads, it may be a better choice. The Arriflex 16M was a mainstay of NFL Films in their early years before they switched to the 16SR series cameras. All 16 S accessories, except magazines and torque motors are compatible with the 16 M. The magazines, although similar to the 16 BL magazines are not compatible with the 16 BL. UPDATE: I am generally no longer servicing the Arriflex 16St cameras. These cameras are very labor intensive and at a labor rate of $150.- per hour, the cost of anything beyond a very basic service can exceed the purchase cost of a used camera. Parts have been unavailable from ARRI for decades. These tools are extremely hard to find and no longer available from ARRI. If you are a camera service technician, or advanced hobbyist interested in doing your own service, they can be invaluable. Please get in touch with me via e-mail if you are interested.